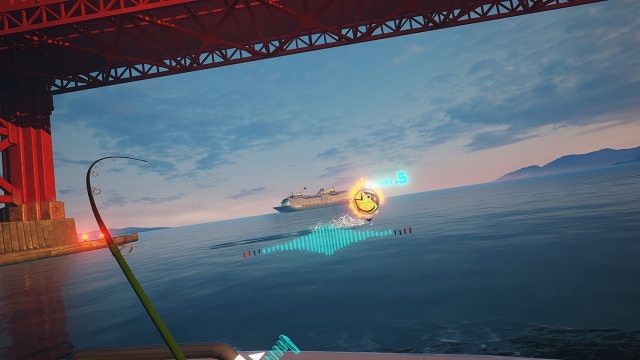 Fishing Master brings the experience of casting a line off of the back of a boat and reeling in a big catch to your game room through the magic of VR. Using a Move controller as your rod, you flick the controller forward and release the button to cast your line into the water. Unlike real fishing, you'll only have to wait a few seconds before you get a bite, at which point you need to pull up the controller to hook the fish. As you bring the fish in, you'll need to pull the rod in the opposite direction while keeping the line tension in the sweet spot. Pull the fish in and you'll see what you caught, and will be given a rating for your catch based on fish size and rarity. If you lose the fish, there's no penalty other than not knowing what you had on the line and having to cast your line again. Each fish you catch adds a little coin to your pocket, which you can use to upgrade your tackle. You can purchase a new rod, reel, line, lure, and soda can, although it's not entirely clear why one piece of tackle is better than another other than it costs more coin. The general idea is that the better your gear, the better your chances of landing larger and rarer fish, but how this happens is left as a mystery whose secret is held tightly by the RNG under the game's hood. From a gameplay perspective, one rod feels pretty much the same as the next. The game includes three different locations for you to fish in, San Francisco Bay, a lake in Switzerland, and the Arctic Ocean. All of the locations look quite good, and it's enjoyable to take a little time at each environment while you're immersed in it by VR. The fish also look quite realistic, and you can admire your catch both on the floating ratings board that appears when you land it or as it lies on the deck of your boat. At first the beauty of the environments and the novelty of fishing in VR make the game interesting, but that wears off pretty quickly. The game is essentially a single, short mini game that you play over and over again. Every time you cast your line it will drop into the water at the same point, you'll always get a bite within a couple of seconds, and then you just keep the tension meter in the sweet spot. You can't move your boat across the water and there's no looking for schools of fish with sonar or anything else. the game is more like playing a slot machine than it is a fishing simulator, pull the handle, see which fish you win, repeat. 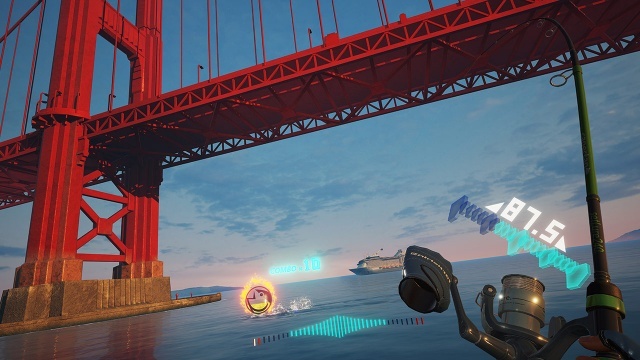 A few casts of your line make Fishing Master an enjoyable enough VR demo, the kind of game you'll fire up when you have friends over who haven't tried VR before. It's not the kind of game that you'll sit down and play for an hour, though. It's just too simple and too repetitive to hold your interest for long. Final Rating: 55% - Fishing in beautiful environments with all the depth of play of a simple mobile game.